Texas factory activity declined in May after two months of increases, according to business executives responding to the Texas Manufacturing Outlook Survey. The production index, a key measure of state manufacturing conditions, fell from 5.8 to -13.1, hitting its lowest reading in a year. Other measures of current manufacturing activity also reflected contraction this month. The new orders index fell more than 20 points to -14.9 after pushing into positive territory last month. The growth rate of orders index has been negative since late 2014 and fell to -14.7 in May after climbing to near zero in April. The capacity utilization and shipments indexes returned to negative territory after two months of positive readings, coming in at yearlong lows of -11.0 and -11.5, respectively. Perceptions of broader business conditions were more pessimistic this month. The general business activity index declined from -13.9 to -20.8, and the company outlook index fell 10 points to -16.1. The impact of lower oil prices is still being felt in the Dallas region. It seems likely the ISM manufacturing index will show contraction in May, although the consensus is for a reading of 50.6 (slow expansion). The S&P/Case-Shiller U.S. National Home Price Index, covering all nine U.S. census divisions, reported a 5.2% annual gain in March, down from 5.3% the previous month. The 10-City Composite and the 20-City Composites’ year-over-year gains remained unchanged at 4.7% and 5.4%, respectively, from the prior month. Before seasonal adjustment, the National Index posted a month-over-month gain of 0.7% in March. The 10-City Composite recorded a 0.8% month-over-month increase while the 20-City Composite posted a 0.9% increase in March. After seasonal adjustment, the National Index recorded a 0.1% month-over-month increase, the 10-City Composite posted a 0.8% increase, and the 20-City Composite reported a 0.9% month-over-month increase. After seasonal adjustment, six cities saw prices rise, one city was unchanged, and 13 cities experienced negative monthly price changes. The Composite 10 index is off 10.6% from the peak, and up 0.8% in March (SA). The Composite 20 index is off 8.9% from the peak, and up 0.9% (SA) in March. The National index is off 3.0% from the peak, and up 0.1% (SA) in March. The National index is up 31.1% from the post-bubble low set in December 2011 (SA). The Composite 10 SA is up 4.7% compared to March 2015. Note: According to the data, prices increased in 19 of 20 cities month-over-month seasonally adjusted. (the press release says 6). Note: S&P is having difficulty this morning. The S&P/Case-Shiller Home Price Index, covering the entire nation rose 5.2% in the 12 months ended in March, slightly less than a 5.3% increase in February. The 10-city index gained 4.7% from a year earlier and the 20-city index gained 5.4% year-over-year. Month-over-month prices the U.S. Index rose 0.7% in March before seasonal adjustment; the 20-city index rose 0.9% and the 10-city index rose 0.8% from February to March. After seasonal adjustment, the national index rose 0.1% month-over-month, the 10-City index posted a 0.8% increase, and the 20-City index reported a 0.9% month-over-month increase. • At 8:30 AM ET, Personal Income and Outlays for April. The consensus is for a 0.4% increase in personal income, and for a 0.7% increase in personal spending. And for the Core PCE price index to increase 0.2%. • At 9:00 AM, S&P/Case-Shiller House Price Index for March. Although this is the February report, it is really a 3 month average of January, February and March prices. The consensus is for a 5.1% year-over-year increase in the Comp 20 index for March. The Zillow forecast is for the National Index to increase 5.3% year-over-year in March. • At 9:45 AM, Chicago Purchasing Managers Index for May. The consensus is for a reading of 50.7, up from 50.4 in April. • At 10:00 AM, the Dallas Fed Survey of Manufacturing Activity for May. From CNBC: Pre-Market Data and Bloomberg futures: S&P are up 5 and DOW futures are up 50 (fair value). Oil prices were up over the last week with WTI futures at $49.49 per barrel and Brent at $49.76 per barrel. A year ago, WTI was at $60, and Brent was at $63 - so prices are down about 20%+ year-over-year. Here is a graph from Gasbuddy.com for nationwide gasoline prices. Nationally prices are at $2.32 per gallon (down about $0.40 per gallon from a year ago). The new supplies from the U.S., Iraq, and Iran brought prices down dramatically. And in response, demand has been climbing back up. U.S. consumption over the last 12 months was 800,000 b/d higher than in 2013, a 4% increase. Vehicle miles traveled in the U.S. are up 6% over the last two years. Low prices are increasing demand and will also dramatically reduce supply. The EIA is estimating that U.S. production from shale formations is down almost a million barrels a day from last year. These factors all contributed to a rebound in the price of oil, which traded below $30/barrel at the start of this year but is now back close to $50. Nevertheless, I doubt that $50 is high enough to reverse the decline in U.S. shale production. Nor is the slashing that we’ve seen in longer-term oil-producing projects about to be undone. And while there is enough geopolitical stability at the moment in places like Iraq and Iran to sustain significantly higher levels of production than we saw in 2013, there is no shortage of news elsewhere in the world that could develop into important new disruptions. For example, conflict in Nigeria may cut that country’s oil production by a million barrels a day. Adding a million barrels/day to U.S. oil demand and subtracting 2 million b/d from U.S. and Nigerian supply would seem to go a long way toward erasing that glut in oil supply that we’ve been hearing about. According to Gasbuddy.com, gasoline prices are down to a national average of $2.33 per gallon. One year ago for the week of Memorial Day, prices were at $2.75 per gallon, and for the same week two years ago prices were $3.75 per gallon. This is the lowest Memorial Day gasoline prices since 2005 (even lower than in 2009). Ten years ago, price were at $2.94 per gallon, and fifteen years ago at $1.74. According to Bloomberg, WTI oil is at $49.61 per barrel, and Brent is at $49.60 per barrel. Last year on Memorial Day, Brent was at $65.37 per barrel, and two years ago Brent was at $110.01. First, I live in California, and I was shocked to hear Donald Trump say there is no drought in the state. That is the opposite of what the data says! While the reservoirs in California’s wetter, more northern reaches have reached (or are nearing) capacity after a slightly wetter-than-average winter in that part of the state, multi-year water deficits remain enormous. The 2015-2016 winter did bring some drought relief to California, but nearly all long-term drought indicators continue to suggest that California remains in a significant drought. Residents of Southern California–who witnessed a much drier than average winter this year despite the occurrence of one of the strongest El Niño events on record–can certainly attest to this. In fact, nearly all of California is still “missing” at least 1 year’s worth of precipitation over the past 4 years, and in Southern California the numbers suggest closer to 2-3 years’ worth of “missing” rain and snow. These numbers, of course, don’t even begin to account for the effect of consecutive years of record-high temperatures, which have dramatically increased evaporation in our already drought-stressed region. For the current year, these tables show the snowpack in the North, Central and South Sierra. Currently the statewide snowpack is about 29% of normal for this date. This graph shows the snow water content for Upper Tyndall Creek for the last 20+ years. For Pacific Crest Trail and John Muir Trail hikers, I recommend using the Upper Tyndall Creek sensor to track the snow conditions. This is the fifth dry year in a row along the JMT - although more snow than the previous four years. As Swain noted, "California remains in a significant drought". Mr. Trump's comments were incorrect and irresponsible. Second, Mr. Trump was also quoted as saying that anyone who believes the unemployment rate is 5% is a "dummy". I don't believe the headline U-3 unemployment rate tells the entire story, and that is why I also track U-6 (a measure of underemployment) and other measures. But U-3 is measured in a transparent way - and remains a key measure of unemployment - and is measured consistently. When we use U-6 (includes "unemployed, plus all marginally attached workers plus total employed part time for economic reasons") we need to compare to previous readings of U-6, not previous readings of U-3. Currently U-6 is at 9.7%. U-6 bottomed in 2006 at 7.9% and in 2000 at 6.8%. So U-6 is still elevated and there is still slack in the labor market. Also, some people think the participation rate will increase significantly as the labor market improves. I've written about the participation rate extensively, and I've pointed out that most of the recent decline in the participation rate can be explained by demographics and various long term trends. There is no huge hidden pool of workers that will suddenly show up in the labor force. Looking at the data, Mr. Trump's suggestion that unemployment is closer to 20% than 5% is absurd. I guess Trump thinks I'm a "dummy"! I think he is reckless and irresponsible. Here is the unofficial problem bank list for May 2016. Update on the Unofficial Problem Bank List for May 2016. During the month, the list fell from 214 institutions to 205 after 12 removals and three additions. Assets dropped by $1.6 billion, even after a $343 million increase with the roll to 2016q1 figures, to an aggregate $60.8 billion. A year ago, the list held 324 institutions with assets of $91.2 billion. We were expecting the FDIC to release first quarter industry results and an update on the Official Problem Bank List but the FDIC was a no-show. Actions have been terminated against Home State Bank, National Association, Crystal Lake, IL ($603 million); International Bank of Chicago, Chicago, IL ($503 million); Pan American Bank, Los Angeles, CA ($160 million Ticker: PAMB); Citizens Bank & Trust Company, Eastman, GA ($130 million); American Founders Bank, Inc., Lexington, KY ($100 million); and SouthFirst Bank, Sylacauga, AL ($89 million Ticker: SZBI). Pan American Bank had been operating under an enforcement action since 2005. Other departure methods included the failure of First CornerStone Bank, King of Prussia, PA ($107 million); voluntary liquidation of SouthBank, a Federal Savings Bank, Huntsville, AL ($65 million); and the mergers of National Bank of California, Los Angeles, CA ($424 million Ticker: NCAL); National Bank of Tennessee, Newport, TN ($144 million); Park Federal Savings Bank, Chicago, IL ($142 million Ticker: PFED); and American Bank of Huntsville, Huntsville, AL ($113 million). The removal SouthBank is an infrequent way to leave the list with the last voluntary liquidation removal being Hartford Savings Bank, Hartford, WI, back in March 2014. Added this month were Delaware Place Bank, Chicago, IL ($265 million); Indus American Bank, Edison, NJ ($247 million); and The First National Bank of Scott City, Scott City, KS ($121 million). This is the most new monthly additions to the list since December 2015. Other key indicators include May vehicle sales, the May ISM manufacturing and non-manufacturing indexes, and the April trade deficit. 8:30 AM ET: Personal Income and Outlays for April. The consensus is for a 0.4% increase in personal income, and for a 0.7% increase in personal spending. And for the Core PCE price index to increase 0.2%. 9:00 AM: S&P/Case-Shiller House Price Index for March. Although this is the February report, it is really a 3 month average of January, February and March prices. This graph shows the nominal seasonally adjusted National Index, Composite 10 and Composite 20 indexes through the February 2016 report (the Composite 20 was started in January 2000). The consensus is for a 5.1% year-over-year increase in the Comp 20 index for March. The Zillow forecast is for the National Index to increase 5.3% year-over-year in March. 9:45 AM: Chicago Purchasing Managers Index for May. The consensus is for a reading of 50.7, up from 50.4 in April. 10:00 AM: Dallas Fed Survey of Manufacturing Activity for May. 10:00 AM: ISM Manufacturing Index for May. The consensus is for the ISM to be at 50.6, down from 50.8 in April. The ISM manufacturing index indicated expansion at 50.8% in April. The employment index was at 49.2%, and the new orders index was at 55.8%. 10:00 AM: Construction Spending for April. The consensus is for a 0.6% increase in construction spending. All day: Light vehicle sales for May. The consensus is for light vehicle sales to decrease to 17.3 million SAAR in May from 17.4 million in April (Seasonally Adjusted Annual Rate). 8:15 AM: The ADP Employment Report for May. This report is for private payrolls only (no government). The consensus is for 175,000 payroll jobs added in May, up from 156,000 added in April. 8:30 AM: The initial weekly unemployment claims report will be released. The consensus is for 267 thousand initial claims, down from 268 thousand the previous week. 8:30 AM: Employment Report for May. The consensus is for an increase of 158,000 non-farm payroll jobs added in May, down from the 160,000 non-farm payroll jobs added in April. In April, the year-over-year change was 2.69 million jobs. The consensus is for the U.S. trade deficit to be at $41.0 billion in April from $40.4 billion in March. 10:00 AM: the ISM non-Manufacturing Index for May. The consensus is for index to decrease to 55.5 from 55.7 in April. 10:00 AM: Manufacturers' Shipments, Inventories and Orders (Factory Orders) for April. The consensus is a 2.0% increase in orders. Freddie Mac reported that the Single-Family serious delinquency rate decreased in April to 1.15% from 1.20% in March. Freddie's rate is down from 1.66% in April 2015. This is the lowest rate since August 2008. Fannie Mae reported today that the Single-Family Serious Delinquency rate declined in April to 1.40%, down from 1.44% in March. The serious delinquency rate is down from 1.73% in April 2015. The Freddie Mac serious delinquency rate has fallen 0.51 percentage points over the last year, and at that rate of improvement, the serious delinquency rate will be below 1% until the second half of this year. The Fannie Mae serious delinquency rate has fallen 0.33 percentage points over the last year, and at that rate of improvement, the serious delinquency rate will not be below 1% until the second half of 2017. I expect an above normal level of Fannie and Freddie distressed sales through 2016 (mostly in judicial foreclosure states). During any 5-year period that including any part the late 70’s there were virtually no areas that experienced a drop in home prices. That isn’t too surprising given the high inflation rate/nominal income growth rate of the period. What was more surprising is that for any 5-year periods ending from early 2000 (which basically means the latter half of the 1990’s) to the fall of 2006 there were no MSA which experienced a drop in home prices, since those periods were characterized by relative modest inflation and nominal income growth. It is worth noting that most “models” of mortgage defaults used in the early and mid 2000’s were based on loans originated from 1995/6 or later, as it was around then that the use of credit scores become widespread. As such, these “models” used a period when there were hardly any parts of the country where home prices had declined. ... During this period actual mortgage losses were incredibly low, models predicted low losses going forward, and in hindsight it’s not surprising that mortgage lending criteria eased considerably over the period, moving from “historically very easy” in 2000-2001 to “ridiculously easy” in the 2003-2006” period. Chart uses Freddie Mac’s Home Price Index for 381 MSAs. The chart shows the number of MSA HPIs that declined over a rolling 5-year (60 month) period. 1 See, e.g., “Model Stability and the Subprime Mortgage Crisis,” An, Deng, Rosenblatt, and Yen, September 2010. CR Note: These are some key point in understanding the bubble. The models used to predict defaults were based on a period with rising home prices, and also on a period with different lending criteria. In the early '90s, lending was based on the 3Cs (Collateral, Capacity, and Credit), and that moved to mostly credit scores in the 2000s. 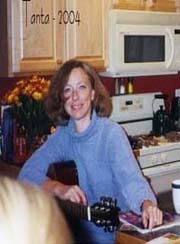 Real gross domestic product -- the value of the goods and services produced by the nation’s economy less the value of the goods and services used up in production, adjusted for price changes -- increased at an annual rate of 0.8 percent in the first quarter of 2016, according to the "second" estimate released by the Bureau of Economic Analysis. In the fourth quarter, real GDP increased 1.4 percent. Here is a Comparison of Second and Advance Estimates. PCE growth was unrevised at 1.9%. Residential investment was revised up from 14.8% to 17.1%. This was close to the consensus forecast. A few excerpts from a research piece by Ethan Harris at Merrill Lynch: Fed Watch: June, July or September? It is now clear that June is very much on the table. What is less clear is whether the Fed is just protesting the super-low probability priced into the markets or is setting us up for a June hike. In other words, should we stick to our September call or flip flop? We are sticking to September. In our view, the distribution of outcomes is very flat, but September still seems most consistent with Yellen’s high risk aversion. June seems a bit early given how dovish she has sounded. Moreover, with the market pricing in just a 34% chance of a move, it would shock the markets and bring into question their credibility. This would draw attention to the competence of the Fed during an election year. The Fed would also be moving in front of the Brexit vote, a potential serious shock to financial markets. What is the cost of waiting? • At 8:30 AM ET, Gross Domestic Product, 1st quarter 2016 (Second estimate). The consensus is that real GDP increased 0.9% annualized in Q1, revised up from a 0.5% increase. • At 10:00 AM, University of Michigan's Consumer sentiment index (final for May). The consensus is for a reading of 95.5, down from the preliminary reading 95.8, and up from 89.0 in April. • At 1:15 PM, Discussion with Fed Chair Janet Yellen, A conversation with Professor Gregory Mankiw, followed by the presentation of the Radcliffe Medal to Chair Yellen. Watch live here. The Federal Reserve Bank of Kansas City released the May Manufacturing Survey today. According to Chad Wilkerson, vice president and economist at the Federal Reserve Bank of Kansas City, the survey revealed that Tenth District manufacturing activity declined modestly. The Kansas City region was hit hard by lower oil prices. The Pending Home Sales Index, a forward-looking indicator based on contract signings, hiked up 5.1 percent to 116.3 in April from an upwardly revised 110.7 in March and is now 4.6 percent above April 2015 (111.2). After last month's gain, the index has now increased year-over-year for 20 consecutive months. This was way above expectations of a 0.8% increase for this index. Note: Contract signings usually lead sales by about 45 to 60 days, so this would usually be for closed sales in May and June. In the week ending May 21, the advance figure for seasonally adjusted initial claims was 268,000, a decrease of 10,000 from the previous week's unrevised level of 278,000. The 4-week moving average was 278,500, an increase of 2,750 from the previous week's unrevised average of 275,750. There were no special factors impacting this week's initial claims. This marks 64 consecutive weeks of initial claims below 300,000, the longest streak since 1973. The dashed line on the graph is the current 4-week average. The four-week average of weekly unemployment claims increased to 278,500. This was below the consensus forecast. The low level of claims suggests relatively few layoffs. • At 8:30 AM ET, The initial weekly unemployment claims report will be released. The consensus is for 275 thousand initial claims, down from 278 thousand the previous week. • Also at 8:30 AM, Durable Goods Orders for April from the Census Bureau. The consensus is for a 0.3% increase in durable goods orders. • At 10:00 AM, Pending Home Sales Index for April. The consensus is for a 0.8% increase in the index. • At 11:00 AM, Kansas City Fed Survey of Manufacturing Activity for May. From Tim Duy: Should The Fed Tolerate 5% Unemployment? In April, 41 states had increasing activity including minor increases. Five states have seen declines over the last 6 months, in order they are Wyoming (worst), North Dakota, Alaska, Louisiana and Oklahoma - mostly due to the decline in oil prices. Economist Tom Lawler sent me the table below of short sales, foreclosures and all cash sales for selected cities in April. "While the overall appreciation rate was robust in the first quarter, home price appreciation was somewhat less widespread than in recent quarters," said FHFA Supervisory Economist Andrew Leventis. "Twelve states and the District of Columbia saw price declines in the quarter—the most areas to see price depreciation since the fourth quarter of 2013. Although most declines were modest, such declines are notable given the pervasive and extraordinary appreciation we have been observing for many years." While the purchase-only HPI rose 5.7 percent from the first quarter of 2015 to the first quarter of 2016, prices of other goods and services were nearly unchanged. The inflation-adjusted price of homes rose approximately 5.6 percent over the latest year. With this quarter's release, FHFA is publishing a set of experimental annual house price indexes for five-digit ZIP codes across the country from 1975―2015.​ The indexes are constructed using the typical "repeat-transactions" methodology. Unlike FHFA's other price indexes, however, the five-digit ZIP code measures are annual price measures, meaning that a single index value is produced for each year. As discussed in FHFA Working Paper 16-01, the new indexes may be valuable to analysts seeking data on localized home price movements. I'm checking on my zip code! MBA: "Purchase Applications Increase and Refis Hold Steady in Latest MBA Weekly Survey"
Mortgage applications increased 2.3 percent from one week earlier, according to data from the Mortgage Bankers Association’s (MBA) Weekly Mortgage Applications Survey for the week ending May 20, 2016. The average contract interest rate for 30-year fixed-rate mortgages with conforming loan balances ($417,000 or less) increased to 3.85 percent from 3.82 percent, with points increasing to 0.37 from 0.34 (including the origination fee) for 80 percent loan-to-value ratio (LTV) loans. Refinance activity increased a little this year when rates declined. According to the MBA, the unadjusted purchase index is 17% higher than a year ago. • At 7:00 AM ET, he Mortgage Bankers Association (MBA) will release the results for the mortgage purchase applications index. • At 9:00 AM, FHFA House Price Index for March 2016. This was originally a GSE only repeat sales, however there is also an expanded index. The consensus is for a 0.5% month-to-month increase for this index. This is a leading indicator for industrial production and suggests increases in Industrial Production later this year. As part of the new home sales report, the Census Bureau reported the number of homes sold by price and the average and median prices. From the Census Bureau: "The median sales price of new houses sold in April 2016 was $321,100; the average sales price was $379,800." The average price in April 2016 was $379,800 and the median price was $321,100. Both are above the bubble high (this is due to both a change in mix and rising prices). The median is at a new high. Less than 2% of new homes sold were under $150K in April 2016. This is down from 30% in 2002. The under $150K new home is probably going away. The $400K+ bracket has increased significantly. The new home sales report for April was very strong at 619,000 on a seasonally adjusted annual rate basis (SAAR), and combined sales for January, February and March were revised up by 44 thousand SAAR. This was the highest sales rate since January 2008. Sales were up 23.8% year-over-year (YoY) compared to April 2015. And sales are up 9.0% year-to-date compared to the same period in 2015. Earlier: New Home Sales increased sharply to 619,000 Annual Rate in April. This graph shows new home sales for 2015 and 2016 by month (Seasonally Adjusted Annual Rate). Sales to date are up 9.0% year-over-year, mostly because of the strong sales in April. Overall I expect lower growth this year, probably in the 4% to 8% range. Slower growth is likely this year because Houston (and other oil producing areas) will have a problem this year. Inventory of existing homes is increasing quickly and prices will probably decline in those areas. And that means new home construction will slow in those areas too. The "distressing gap" graph shows existing home sales (left axis) and new home sales (right axis) through April 2016. This graph starts in 1994, but the relationship had been fairly steady back to the '60s. Overall repayment rates generally improved in the first quarter of this year. Five percent of outstanding debt was in some stage of delinquency, the lowest amount since the second quarter of 2007. 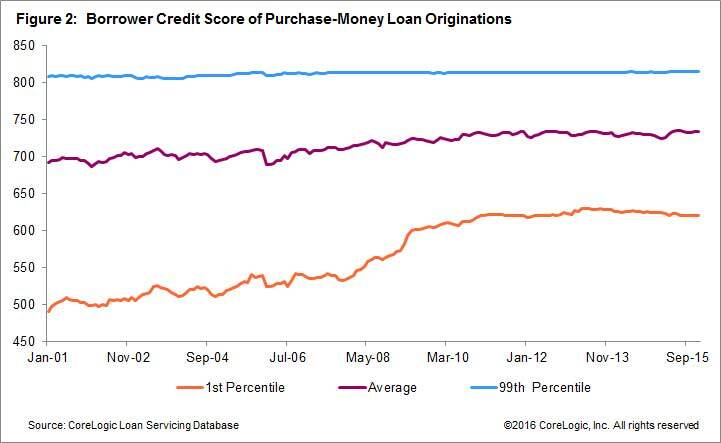 The first graph shows aggregate consumer debt increased in Q1. Household debt peaked in 2008, and bottomed in Q2 2013. Mortgage balances, the largest component of household debt, increased in the first quarter. Mortgage balances shown on consumer credit reports stood at $8.37 trillion, a $120 billion increase from the fourth quarter of 2015. Balances on home equity lines of credit (HELOC) dropped by $2 billion, to $485 billion. Non-housing debt balances rose somewhat in the first quarter; increases of $7 billion and $29 billion in auto and student loans, respectively, were offset by a $21 billion decline in credit card balances. The second graph shows the percent of debt in delinquency. The percent of delinquent debt is declining, although there is still a large percent of debt 90+ days delinquent (Yellow, orange and red). Overall delinquency rates improved in 2016Q1. As of March 31, 5.0% of outstanding debt was in some stage of delinquency. Of the $613 billion of debt that is delinquent, $436 billion is seriously delinquent (at least 90 days late or “severely derogatory”). The Census Bureau reports New Home Sales in April were at a seasonally adjusted annual rate (SAAR) of 619 thousand. The previous three months were revised up by a total of 44 thousand (SAAR). "Sales of new single-family houses in April 2016 were at a seasonally adjusted annual rate of 619,000, according to estimates released jointly today by the U.S. Census Bureau and the Department of Housing and Urban Development. This is 16.6 percent above the revised March rate of 531,000 and is 23.8 percent above the April 2015 estimate of 500,000." The months of supply decreased in April to 4.7 months. "The seasonally adjusted estimate of new houses for sale at the end of April was 243,000. This represents a supply of 4.7 months at the current sales rate." In April 2016 (red column), 55 thousand new homes were sold (NSA). Last year 48 thousand homes were sold in April. The all time high for April was 116 thousand in 2005, and the all time low for April was 30 thousand in 2011. This was well above expectations of 523,000 sales SAAR in April, and prior months were revised up. A very strong report. I'll have more later today. According to Black Knight's First Look report for April, the percent of loans delinquent increased 3.8% in April compared to March, and declined 10.3% year-over-year. The percent of loans in the foreclosure process declined 5.9% in April and were down 27.8% over the last year. Black Knight reported the U.S. mortgage delinquency rate (loans 30 or more days past due, but not in foreclosure) was 4.24% in April, up from 4.08% in Maarch. The percent of loans in the foreclosure process declined in April 1.17%. The number of delinquent properties, but not in foreclosure, is down 235,000 properties year-over-year, and the number of properties in the foreclosure process is down 225,000 properties year-over-year. Black Knight will release the complete mortgage monitor for April on June 6th. • At 10:00 AM ET, New Home Sales for April from the Census Bureau. The consensus is for a increase in sales to 523 thousand Seasonally Adjusted Annual Rate (SAAR) in April from 511 thousand in March. Mortgage rates were relatively steady again, marking the third straight business day with almost no rate movement following last week's quick spike higher. That spike was all about financial markets quickly coming to terms with a higher probability of a Fed rate hike. Given that there hasn't been any movement since then, we can increasingly assume that markets took care of this business by Wednesday afternoon. While it's reassuring that we haven't seen any additional move higher in rates, neither have we seen any meaningful move lower. That leaves the average conventional 30yr fixed rate quote at 3.75%, but there are still quite a few lenders quoting 3.625%. Oil prices are "only" down about 20% year-over-year (YoY), and the YoY decline has been decreasing. So I thought I'd look at the YoY change in oil prices over the last few decades. This graph shows the year-over-year change in WTI based on data from the EIA. Five times since 1987, oil prices have increased 100% or more YoY. And several times prices have almost fallen in half YoY. Oil prices are volatile! And it seems likely the YoY change will turn positive later this year. "... 35% probability for a hike in June, a 35% probability for July, a 20% probability for September—our previous modal forecast—and a 10% probability for either a later hike or a cut." This suggests a cumulative forecast probability of 70% by the July meeting, and 90% by September. The Fed has definitely changed expectations. For amusement ... early in my career, as a scientist at SAIC in San Diego (my undergraduate degree is in chemistry), I was invited to a sales meeting to discuss potential new contracts. A senior salesperson discussed one potential contract, and he was asked the probability of obtaining the contract. He said it was 50%. Asked how he came up with the odds, he said: "Either we get it or we don't." The Fed is more data dependent than that salesperson. A pickup in inflation and a decent jobs report will increase the odds of a June rate hike. But I suspect that sales guy would put the odds at 50%: Either they hike or they don't! One of the key factors used in mortgage underwriting as well as in our Housing Credit Index is the credit score. The average borrower credit score for home-purchase originations has increased from roughly 700 in 2005 to almost 750 in 2015 (Figure 2). In 2005, the credit score for the first percentile ranged from 520 to 540 and showed a dramatic rise during the Great Recession, and is currently running in a range of 620 to 630. By just gazing at the borrowers’ credit scores, one could conclude that mortgage originations were constrained as a result of tight underwriting standards. But how has loan demand changed, particularly for the borrowers with relatively low credit scores? The origination volume is the end result of an interplay between loan applicants’ demand and lenders’ risk tolerances. Is there a way to disentangle mortgage credit supply conditions from mortgage demand? 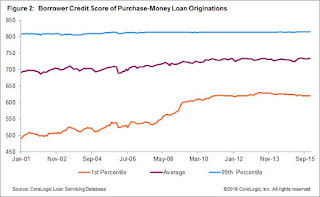 This graph from CoreLogic shows the significant increase in credit scores for the first percentile of borrowers. At first glance, this would appear to be due to tighter underwriting standards, but Pradhan looks at denial rates and asks: If Credit Underwriting Has Tightened, Why Have Denial Rates Fallen? The data shows that demand has fallen for low credit score borrowers; either they are more cautious, or - more likely - they are discouraged from even applying. Interesting data. Bottom Line: This is not a drill. This meeting is the real thing - an undoubtedly lively debate that could end with a rate hike. I think we narrowly avoid a rate hike, but at the cost of moving forward the next hike to the July meeting. Oil prices were up over the last week with WTI futures at $48.28 per barrel and Brent at $48.72 per barrel. A year ago, WTI was at $59, and Brent was at $64 - so prices are down about 20%+ year-over-year. Here is a graph from Gasbuddy.com for nationwide gasoline prices. Nationally prices are at $2.28 per gallon (down about $0.45 per gallon from a year ago). U.S. crude for June delivery settled down 41 cents, or 0.9%, at $47.75 a barrel on the New York Mercantile Exchange. Prices rose 3.3% this week and are up 6.9% in the past two weeks. Brent, the global benchmark, fell 9 cents, or 0.2%, to $48.72 a barrel on ICE Futures Europe. Prices rose 1.9% this week and 7.4% in the past two weeks. Production outages around the world have fueled gains in oil prices in recent weeks, chipping away from the oversupply that has plagued the market for nearly two years. Wildfires in Canada have taken some oil fields there out of commission, while disruptions in Nigeria and Libya have also given prices a lift. Prices really collapsed at the end of 2014 - and then rebounded a little - and then collapsed again. Some of the recent rebound is due to production outages, and some is probably seasonal. The key economic reports this week are April New Home sales, and the second estimate of Q1 GDP. The consensus is for a increase in sales to 523 thousand Seasonally Adjusted Annual Rate (SAAR) in April from 511 thousand in March. 9:00 AM: FHFA House Price Index for March 2016. This was originally a GSE only repeat sales, however there is also an expanded index. The consensus is for a 0.5% month-to-month increase for this index. 8:30 AM: The initial weekly unemployment claims report will be released. The consensus is for 275 thousand initial claims, down from 278 thousand the previous week. 8:30 AM: Durable Goods Orders for April from the Census Bureau. The consensus is for a 0.3% increase in durable goods orders. 10:00 AM: Pending Home Sales Index for April. The consensus is for a 0.8% increase in the index. 11:00 AM: Kansas City Fed Survey of Manufacturing Activity for May. 8:30 AM ET: Gross Domestic Product, 1st quarter 2016 (Second estimate). The consensus is that real GDP increased 0.9% annualized in Q1, revised up from a 0.5% increase. 10:00 AM: University of Michigan's Consumer sentiment index (final for May). The consensus is for a reading of 95.5, down from the preliminary reading 95.8, and up from 89.0 in April. 10:30 AM: Fed Chair Janet Yellen will have a discussion with Professor Greg Mankiw at Radcliffe Institute for Advanced Study at Harvard University.